Vinsanity ● n. a deranged state of mind usually occurring when the love of wine drives you crazy…so call me a cab. Carbon dioxide that is...which is a good thing. During primary fermentation the sugar in the grape must is converted, mostly to ethyl alcohol and carbon dioxide (CO²). What does this mean? Well, for one thing the CO² creates an extremely inhospitable environment for nasty microbes that may want to populate the surface of the fermentation...for Vinogirl and Vinomaker, it means the above Syrah will taste really good in a glass on the deck. ...now you don't! Today was our Syrah harvest, (as the above 'before & after' piccy shows). Vinomaker had recruited two reliable 'Wine Slaves' to help us relieve the vines of their crop, but it still took rather a long time. This is probably the earliest Vinomaker can remember harvesting Syrah. The past weeks warm temps had brought the fruit on beautifully; nice ripe, sweet flavours and softened skins...no hint of green beans at all. I must admit I took pride in the crop and I gave myself a well deserved pat on the back for my pruning prowess. Well, I would have if my glove hadn't been stuck to my hand with sugary juice. The grapes are in Vinomaker's capable hands now...mine are too sticky!!! Last Saturday afternoon, as you may recall, I toiled away in the vineyard ensuring Vinomaker a supply of raw materials for future vintages. I spent today enjoying the fruits of somebody else's labour. A premium up valley winery released a much anticipated Reserve Cabernet Sauvignon after an absence of 5 years. It was worth the wait. Complex, layered, luscious and bold, without being overbearing like so many other Napa Cabs, the Groth 2005 is a treat for your tongue. Reserve wines are not regulated by any governing body, unlike most things in the wine industry, and quite honestly some wineries just cheat. Michael Weis and his staff have produced a wonderful tipple and have gone above and beyond to create something which is quite extraordinary. Obviously just one technique of theirs, gravity-flow racking, results in a very cherry, and Vinogirl merry, libation. In Vinoworld, this man would be the anointed monarch of all things Vitis. Alas, he's just a Ph.D! 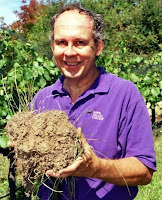 Dr. Stephen Krebs knows more wine industry people (and bad jokes) in Napa than anyone else I know. Probably Sonoma too. Nay, the entire state of California. As Programme Co-ordinator of Viticulture & Winery Technology at Napa Valley College, it's safe to say he has probably trained many of the viticulturists and winemakers, currently working in the valley, during his 20 plus years of tenure. At the very least, most have passed through a class or two of his. Isn't Vinoworld great? One can be an academic and play in the dirt. Lucky sod! Season of mists and mellow fruitfulness. John Keats was waxing lyrical about autumn in England but this season is equally as special in the Napa Valley. If you have never visited here this time of year you have deprived yourself of a exquisite sensory experience. Each season has it's uniqueness, but this time of year you can actually feel the excitement of the season valley wide. It's as if the valley has been snoozing all summer long and has now awakened to fulfil it's oenological promise. Witness the acquiescing of the patient vines to the will of the winemaker, the singing of field workers harvesting tiny orbs of captured sunshine, the humming of tractors laden with bins of fruit, the heady smell of hungry yeast, the olfactory delight of hopeful fermentations. All of these things, and more, combine to make autumn an enchanted time in the valley. Not a time to mourn the passing of summer, nor a time to dread the oncoming winter, but a time to take a moment, feel the mist, breath in the smells and look forward to a glass of Mother Nature's elixir. Here she is, Vinodog 1, acting as usual in her supervisory capacity. She is never too far away, (unlike Vinodog 2 who is usually off somewhere doing her own thing), she is always just close enough to keep an eye on me. At one point though, when they were both nearby, I do think I heard them discussing why the bi-ped wasn't grafting the rootstocks over to something useful like dog biscuits instead of stupid grapes. I'd better watch my back whilst I'm bending over, there may be a 'Canine Mutiny'. This looks worse than it actually is, or at least I hope so. The vine has not had a serious accident, although it looks like it's sporting a giant bandage. This rootstock has just been grafted to Syrah. I tend to be a bit anthropomorphic so if I thought in the least that my poor vines felt anything during field budding I would be devastated. The process involves using an extremely sharp knife to cut a bud from a lignified shoot of a chosen cultivar, making a corresponding cut on the rootstock, taping with a special tape, whacking off most of the rootstocks summer growth and covering the whole thing up under a mound of dirt...until April. Yes, you have to wait a long time to see if your work was fruitful. It's a great way to spend a Saturday afternoon and at least this year I didn't almost cut my pinkie off!!! It does if you are a grape, a wine-grape to be more specific. A small berry has a larger surface area-to-volume ratio, and so more skin to juice. Beyond sugar accumulation other important developments in the berry are the production of compounds such as anthocyanins, tannins and flavanols. Many of these compounds are more abundant in the skin and seeds and when embraced by phenolics they contribute colour, astringency and flavours. The above picture illustrates this ratio difference with the comparison of a table grape (Red globe) to a wine-grape (Syrah -Durrell clone). We do not stress our wine-grapes here, we want them to mature at their own pace. So c'mon boys, be mature about it, admit that size does matter...and in this case, less can be more! Give a dog a Rhone. Here is the QC queen performing an invaluable task during the pressing off of a batch of Viognier today. Her job was to make sure that Vinomaker wasn't overly pressing the grapes, extracting unwanted green and bitter tannins. She seemed pretty pleased with the results...until she got distracted by a wasp and chased after it, (which isn't in her job description). And where is 'Vinodog 1' whilst all this activity is going on? Sunning herself of course...somebody has to supervise the workers. "I've got a crush on you, Viognier". Well Francis Albert actually sang "Sweetie Pie" but seeing as Vinomaker was making wine and not a pastry, I took the liberty of changing the lyric. The amount of grapes was pretty meager, thanks to the April 21st frost, but what we got tasted rather splendid. Don't they look pretty?...as they head towards, well, being crushed quite frankly. Assisting me in the vineyard today was Mr. Sceloporus occidentalis. Although he is a juvenile and barely 2" in length he does a fine job of Integrated Pest Management. Thankfully he is a carnivore and the grapes are safe in his capable hands/claws...and don't worry folks, it's not like he is working without a net. Today was the day Vinomaker and I decided the local avian population were persona non grata: the birds were having way too good of a time with our Syrah. At 23.6 degrees Brix (and a TA of 7.65 and a pH of 3.66) our little crop is probably only 2 weeks away from harvesting. It may look like the grapes are in prison, but the netting is for their own good! Quercus suber. Actually V2 is employed as a QC inspector by Vinomaker. If dogs can be utilised to seek out truffles, why not TCA? Stand still long enough around here and you'll be put to work. Whilst Vinomaker is downstairs feverishly marrying yeast to must, (well, maybe he's not that excited), I am reflecting on the attributes of different strains of yeast. I slipped a 'red herring' into the above photo (thanks Thud). To say, "yeast is yeast" and it all makes alcohol, is akin to saying that a dog is a dog and one can hunt as well as another. Whilst you can make wine with bread yeast, you'll end up hunting with a Chihuahua. 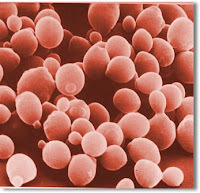 Different yeasts have different characteristics. There are thousands of strains that have been identified and they all behave differently. Some are only capable of fermenting up to 7 or 8 % alcohol. Others will ferment to higher levels, but will also produce foul tasting compounds in the process, etc., etc. One thing is for sure, once the must is charged with yeast, there's no turning back. Today marked the official start of the 2008 harvest for Vinomaker. After a ceremonial clip of some Pinot grigio, I was off to work and Vinomaker was left to process the aforementioned Pinot grigio, some Semillon (pictured above) and a very small amount of Orange muscat, alone. I needn't have felt bad. Vinomaker had a fine old time of it, revelling in the wonder which is white wine production (ultimately more challenging than red), and conjuring up chemistry, formulae and procedure from the previous year. Chefs work their magic several times a day, brewers a few times a week, winemakers get one shot a year. Better get it right Vinomaker, tasters are waiting. ...gather them up, throw them away, get yourself some grapes and make wine. Who ever heard of anyone getting vinsane on lemonade anyway? Wine is wonderful, it makes you happy...simple as that. With harvest 2008 upon us, Napa is the happiest place on earth. Move over Walt and make way for Vinogirl and Vinomaker. Fermentation in this magic kingdom is the most fun. Unleash the yeast...and let the festivities begin!!! Buddy - n. : Buddies/Budettes. The undeveloped or embryonic shoots on a Vinoland grapevine, each individual one a dear and close friend. TWWIAGE: - The winery where I am gainfully employed. WhiffsNotes: - First impressions on wine: brevity abbreviated. Vino Maniacs Around the World. Copyright © 2019 Vinsanity All rights reserved.